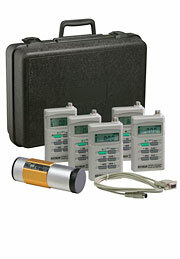 Stores up to 5 dosimeter surveys. Bi-directional RS-232 with Windows® 95/98/NT/2000/ME/XP compatible software to control setup and retrieve stored events or analyze real time measurements. Complete with 9 pin to 25 pin adaptor, and RS-232 cable.